An out-of-state donor, who wished to remain anonymous, gave the organization $60,000. The money covered more than a third of what it took to buy land and build a home in Milton, Vermont, which is nearing completion. "We don't normally get donations that size," said Catherine Stevens of Green Mountain Habitat for Humanity, adding that the donor also supported several other projects by Habitat chapters around the country, also in the name of Pope Francis. The Pope has expressed deep concern over economic inequality across the globe, and has encouraged people everywhere to focus more attention on aiding the disadvantaged. The anonymous donor heard that call, and wanted to honor Pope Francis's commitment to social justice, Stevens said. The mission of the 31-year-old Green Mountain Habitat for Humanity, Stevens explained, is to build simple, energy-efficient homes for low-income working families who live in substandard housing and who could not otherwise qualify for a traditional bank mortgage. As volunteers put the finishing touches on the Milton property which the anonymous donor's gift jump-started, future homeowner Betty Button is getting more and more eager to move in next month. "It's been my dream to have a new home," Button told necn. Button, a medical assistant, said she is raising her two grandchildren, Scott and Kylie, 10, and 7. They have been living in Button's dad's musty old trailer in Hinesburg that recently had a fire in it, the grandmother said. Furthermore, the children have had to share a cramped bedroom, she added. 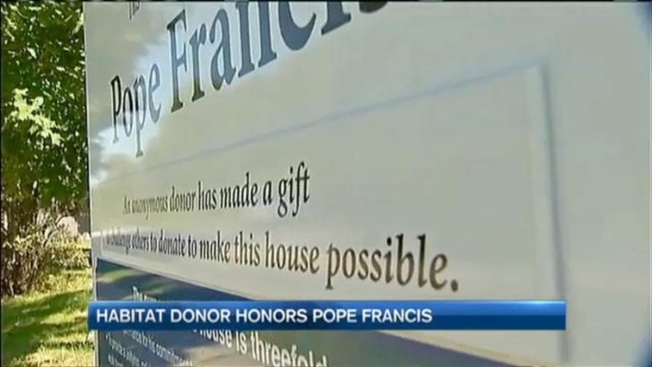 The Milton property has been nicknamed "the Pope Francis House" for the duration of the construction project. Button put many hours of sweat equity into the construction, which is customary at Green Mountain Habitat for Humanity work sites. A large team of volunteers has been working on the site for the past several months. "To have a home of my own for the first time is really special," Button said. "The kids will each have their own bedroom now, which is great. Having a new home has been in my heart as long as I can remember." Button will assume an interest-free mortgage to Green Mountain Habitat for Humanity. Stevens said heating the property should not be a burden on Button because the construction team utilized up-to-date energy efficiency techniques to ensure a well-sealed home. Button said having a safe home she can afford will change the future for her family. "This is going to be my everything," Button said of her new home. Button's future home is one of five from Green Mountain Habitat for Humanity in 2015. For more on the organization, visit this website.